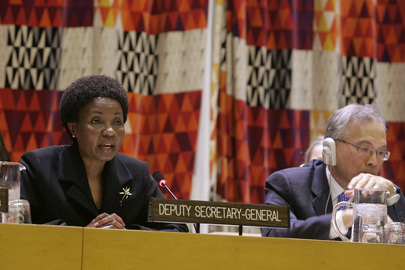 UNITED NATIONS, July 14 -- Less than two weeks after the formation of “UN Women,” to consolidate the UN's agencies working on the issue, one of the agencies has gone forward with a major lease of real estate in Manhattan. The UN Population Fund, UNFPA, has just reportedly signed a 15 year lease for three floors (131,000 square feet) at 605 Third Avenue in midtown Manhattan. Meanwhile, multiple sources tell Inner City Press that during the negotiations to form UN Women, Qatar offered $100 million if it the headquarters would be put in Qatar. But as Inner City Press reported earlier this month, Qatar is one of only three countries which has never sent a female athlete to the Olympic Games, along with Brunei and Saudi Arabia. So now matter how much money is offered, some ask how could the headquarters of UN Women be in Qatar? A Group of 77 source complained, as to UN agency headquarters, that an effect of the European Union's push to form a UN Environment agency would be to undermine the status of Nairobi, where the current UN Environment Program is headquartered. Footnote: while following a series of stories by Inner City Press on the hypocrisy of the UN closing its after school program on two days notice as it discussed UN Women and "work life balance" Deputy Secretary General Asha Rose Migiro said alternatives are being explored, so far nothing has been announced. Watch this site. UNITED NATIONS, July 2 -- As UN Women, the world body's so-called Gender Entity, was birthed Friday in the General Assembly, Inner City Press learned for a well placed Mission about six of the eight candidates for the Under-Secretary General position at the top of UN Women. These are the Rwandan foreign minister, Louise Mushikiwabo, UN gender advisor Rachel Mayanja (nominated by Gabon), a Malaysian official who heads up the gender work of the Non Aligned Movement, officials from Tunisia and Norway and, Inner City Press is told, Sri Lanka's Radhika Coomaraswamy. The biggest donor, assured for that reason a seat on the Executive Board, is said to agree that the USG should come from the Global South. So the Norwegian, it seems, has little chance. Earlier on Friday, Inner City Press asked UN Deputy Secretary General Asha Rose Migiro to name the candidates, since she had said the process would be open and transparent. Eight countries, she said, have submitted names, including one country naming another's national. She gave as an example the United States nominating her. “Have they?” Inner City Press asked. No, she said. Not on the list is Michelle Bachelet of Chile. Some say she wanted UNICEF and is miffed. Others say she will only take it if offered: i.e., if it is not a competitive process. We'll see. Watch this space. UNITED NATIONS, June 25 -- The UN negotiations on the so called Gender Entity continues Friday into the evening, with three issues outstanding. Each was a UN classic. Syria was championing a special mention for women under occupation: that is, Palestine. Cuba disagreed with a paragraph suggesting that countries submit their national programs for UN system review. And the donor countries and the Group of 77 different on the distribution and number of posts, that is, jobs. Follow the money. And follow the posts. 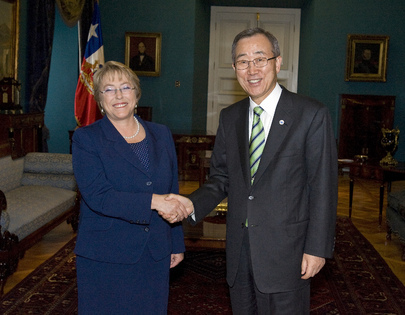 Inner City Press is informed that while many still hope that former Chilean president Michele Bachelet would accept the Gender Entity post, she had wanted UNICEF, which was given to American Anthony Lake. Now the Gender post may go to a Rwandan minister. Earlier on Friday, Inner City Press asked the chair and staffer of the Economic and Social Council if, in exchange for the new Under Secretary General post, the underlying Assistant Secretary General posts would be eliminated. No, two would remain, was the answer. I am sure that the Secretariat is going to say, you know, this is a reform that we brought about, this gender entity. What, in this critical time, what’s the role of the Secretariat in sort, providing I guess, you know, leadership on this gender entity? There are some outstanding issues, and I just wonder whether the Secretariat is chiming in, in terms of how this entity will deal with the developed world or countries in which there is not a presence on the ground? And then, you may not think it’s related, but have you found out whose decision it was to close the UN day care center on two days’ notice? The issue that arose yesterday? I see them as related. Maybe you don’t. Spokesperson Nesirky: Well, starting with the big picture, gender empowerment, gender equality, these are major priorities for the Secretary-General, and for the United Nations as a whole. Indeed gender empowerment is one of the key priorities of the Secretary-General for this year, not least because he and the Deputy Secretary-General have been pushing extremely hard for this new gender entity to come onto being. And so, obviously, we’re watching this very closely. We’re not just watching; I know the Deputy Secretary-General in particular — this is something the Secretary-General has asked her to focus on — he’s very much involved in seeing how this passes through during the course of the day and into next week. And I would anticipate that the Deputy Secretary-General would want to speak to the media once we have a clearer picture of what happens. It is a major priority; it’s something that the Secretary-General and the Deputy Secretary-General have been pushing extremely hard because they believe that it’s essential for us to be able to make progress on many other areas of work, not least, development. And as for the micro-picture, which is not to belittle it at all, because child care is extremely important, I do not have an answer. We’ve asked for an answer but we do not have an answer at the moment. We'll be waiting for that day care center closing answer -- and for the Gender Entity denouement. Watch this site.